^ 1.00 1.01 1.02 1.03 1.04 1.05 1.06 1.07 1.08 1.09 1.10 1.11 NASA/IPAC Extragalactic Database. Results for NGC 4486. [2006-10-22]. ^ Basu, Baidyanath (2003). "An Introduction to Astrophysics". PHI Learning Pvt. Ltd.: 237. ISBN 81-203-1121-3..
^ Towards the 100th Anniversary of the Discovery of Cosmic Jets. Academia Sinica, Institute of Astronomy & Astrophysics. [2016-04-14]. ^ Dreyer, J. L. E. (1888). "A New General Catalogue of Nebulae and Clusters of Stars,being the Catalogue of the late Sir John F.W. Herschel, Bart., revised, corrected, and enlarged.". Memoires of the Royal Astronomical Society 49: 1–237. Bibcode:1888MmRAS..49....1D..
^ Hubble, E. Messier 87 and Belanowsky's Nova. Publications of the Astronomical Society of the Pacific. October 1923, 207 (35): 261. doi:10.1086/123332. ^ Shklovskii, I. S. Supernovae in Multiple Systems. Soviet Astronomy. 1980, 24: 387. Bibcode:1980SvA....24..387S. ^ Hubble follows spiral flow of black-hole-powered jet. ESA/Hubble Press Release. [6 September 2013]. ^ Hubble, E. P. A general study of diffuse galactic nebulae. Astrophysical Journal. 1922, 56: 162–99. Bibcode:1922ApJ....56..162H. doi:10.1086/142698. ^ Hubble, E. P. Extragalactic nebulae. Astrophysical Journal. 1926, 64: 321–69. Bibcode:1926ApJ....64..321H. doi:10.1086/143018. ^ Hubble, Edwin; Humason, Milton L. The Velocity-Distance Relation among Extra-Galactic Nebulae. Astrophysical Journal. 1931, 74: 43. Bibcode:1931ApJ....74...43H. doi:10.1086/143323. ^ Burbidge, G. R. On Synchrotron Radiation from Messier 87. The Astrophysical Journal. 1956, 124: 416. Bibcode:1956ApJ...124..416B. doi:10.1086/146237. ^ Stanley, G. J.; Slee, O. B. Galactic Radiation at Radio Frequencies. II. The Discrete Sources. Australian Journal of Scientific Research A. 1950, 3: 234. Bibcode:1950AuSRA...3..234S. doi:10.1071/ch9500234. ^ Baade, W.; Minkowski, R. On the Identification of Radio Sources. Astrophysical Journal. 1954, 119: 215–31. Bibcode:1954ApJ...119..215B. doi:10.1086/145813. ^ Turland, B. D. Observations of M87 at 5 GHz with the 5-km telescope. Monthly Notices of the Royal Astronomical Society. February 1975, 170: 281–94. Bibcode:1975MNRAS.170..281T. doi:10.1093/mnras/170.2.281. ^ Charles, P. A.; Seward, F. D. Exploring the X-ray universe. Cambridge, United Kingdom: Press Syndicate of the University of Cambridge. 1995: 9. ISBN 0-521-43712-1. ^ Bradt, H.; Naranan, S.; Rappaport, S.; Spada, G. Celestial Positions of X-Ray Sources in Sagittarius. Astrophysical Journal. 1968, 152 (6): 1005–13. Bibcode:1968ApJ...152.1005B. doi:10.1086/149613. ^ Lea, S. M.; Mushotzky, R.; Holt, S. S. Einstein Observatory solid state spectrometer observations of M87 and the Virgo cluster. Astrophysical Journal, Part 1. 1982, 262: 24–32. Bibcode:1982ApJ...262...24L. doi:10.1086/160392. ^ Epsilon Virginis is at celestial coordinates α=13h 02m, δ=+10° 57′; Denebola is at α=11h 49m, δ=+14° 34′. The midpoint of the pair is at α=12h 16m, δ=12° 45′. 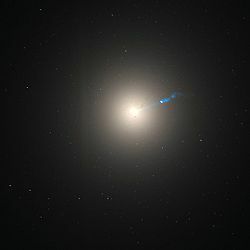 Compare to the coordinates of Messier 87: α=12h 31m, δ=+12° 23′. ^ Luginbuhl, Christian B.; Skiff, Brian A. Observing Handbook and Catalogue of Deep-Sky Objects 2nd. Cambridge, United Kingdom: Cambridge University Press. 1998: 266. ISBN 0-521-62556-4. ^ Cooke, Antony. Visual astronomy under dark skies: a new approach to observing deep space. Patrick Moore's practical astronomy series. London, United Kingdom: Springer-Verlag. 2005: 5–37. ISBN 1-85233-901-2. ^ Clark, Roger Nelson. Visual astronomy of the deep sky. CUP Archive. 1990: 153. ISBN 0-521-36155-9. ^ Visual observations of the M87 jet. Adventures in Deep Space. Astronomy-Mall. [7 December 2010]. ^ Park, Kyung-Suk; Chun, Mun-Suk. Dynamical Structure of NGC 4486. Journal of Astronomy and Space Science. 1987, 4 (1): 35–45. Bibcode:1987JASS....4...35P. ^ Jones, Mark H.; Lambourne, Robert J. An introduction to galaxies and cosmology. Cambridge University Press. 2004: 69. ISBN 0-521-54623-0. ^ Kundu, Arunav; Whitmore, Bradley C. New Insights from HST Studies of Globular Cluster Systems. I. Colors, Distances, and Specific Frequencies of 28 Elliptical Galaxies. The Astronomical Journal. 2001, 121 (6): 2950–73. Bibcode:2001AJ....121.2950K. arXiv:astro-ph/0103021. doi:10.1086/321073. ^ Chakrabarty, Dalia. Mass modelling with minimum kinematic information. Monthly Notices of the Royal Astronomical Society. 2007, 377 (1): 30–40. Bibcode:2007MNRAS.377...30C. arXiv:astro-ph/0702065. doi:10.1111/j.1365-2966.2007.11583.x. ^ Oemler, A., Jr. The structure of elliptical and cD galaxies. Astrophysical Journal. 1976, 209: 693–709. Bibcode:1976ApJ...209..693O. doi:10.1086/154769. ^ Whitmore, B. C. Effect of the Cluster Environment on Galaxies. (编) William R. Oegerle; Michael J. Fitchett; Laura Danly. Clusters of galaxies: proceedings of the Clusters of Galaxies Meeting. Space Telescope Science Institute symposium series. Baltimore: Cambridge University Press: 151. 15–17 May 1989. ISBN 0-521-38462-1. ^ Bird, S.; Harris, W. E.; Blakeslee, J. P.; Flynn, C. The inner halo of M 87: a first direct view of the red-giant population. Astronomy and Astrophysics. 2004, 524: 1–11. Bibcode:2010A&A...524A..71B. arXiv:1009.3202. doi:10.1051/0004-6361/201014876. 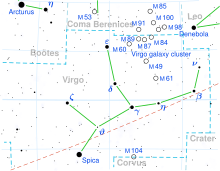 ^ Ventrudo, B. M87: Monster Galaxy in Virgo. One Minute Astronomer. ^ Cohen, Judith G.; Ryzhov, Anton. The Dynamics of the M87 Globular Cluster System. Astrophysical Journal. 1997, 486 (1): 230–241. Bibcode:1997ApJ...486..230C. arXiv:astro-ph/9704051. doi:10.1086/304518. ^ Giant Galaxy is Still Growing. [25 June 2015]. ^ Wu, Xiaoan; Tremaine, Scott. Deriving the Mass Distribution of M87 from Globular Clusters. The Astrophysical Journal. 2006, 643 (1): 210–21. Bibcode:2006ApJ...643..210W. arXiv:astro-ph/0508463. doi:10.1086/501515. ^ Leverington, David. New cosmic horizons: space astronomy from the V2 to the Hubble Space Telescope. Cambridge University Press. 2000: 343. ISBN 0-521-65833-0. ^ Janowiecki, Steven; 等. Diffuse Tidal Structures in the Halos of Virgo Ellipticals. The Astrophysical Journal. 2010, 715 (2): 972–85. Bibcode:2010ApJ...715..972J. arXiv:1004.1473. doi:10.1088/0004-637X/715/2/972. ^ Merritt, David; Tremblay, Benoit. The distribution of dark matter in the halo of M87. The Astronomical Journal. 1993, 106 (6): 2229–42. Bibcode:1993AJ....106.2229M. doi:10.1086/116796. ^ Burns, J. O.; White, R. A.; Haynes, M. P. A search for neutral hydrogen in D and cD galaxies. Astronomical Journal. 1981, 86: 1120–25. Bibcode:1981AJ.....86.1120B. doi:10.1086/112992. ^ Doherty, M.; Arnaboldi, M.; Das, P.; Gerhard, O.; Aguerri, J. A. L.; Ciardullo, R.; Feldmeier, J. J.; Freeman, K. C.; Jacoby, G. H.; Murante, G. The edge of the M 87 halo and the kinematics of the diffuse light in the Virgo cluster core. Astronomy and Astrophysics. August 2009, 502 (3): 771–786. Bibcode:2009A&A...502..771D. arXiv:0905.1958. doi:10.1051/0004-6361/200811532. ^ Klotz, Irene. Galaxy's Outer Halo Lopped Off. Discovery News. 8 June 2009 [25 April 2010]. （原始内容存档于2009年8月23日）. ^ Bland-Hawthorn, Joss; Freeman, Ken. The Baryon Halo of the Milky Way: A Fossil Record of Its Formation. Science. 7 January 2000, 287 (5450): 79–84. Bibcode:2000Sci...287...79B. PMID 10615053. doi:10.1126/science.287.5450.79. ^ Gavazzi, G.; Boselli, A.; Vílchez, J. M.; Iglesias-Paramo, J.; Bonfanti, C. The filament of ionized gas in the outskirt of M87. Astronomy & Astrophysics. 2000, 361: 1–4. Bibcode:2000A&A...361....1G. arXiv:astro-ph/0007323. ^ Longobardi, A; Arnobaldi, M; Gerhard, O; Mihos, J C. The build-up of the cD halo of M87 - evidence for accretion in the last Gyr. arXiv.org. Cornell University Library. [25 June 2015]. ^ Walsh, Jonelle L.; Barth, Aaron J.; Ho, Luis C.; Sarzi, Marc. The M87 Black Hole Mass from Gas-dynamical Models of Space Telescope Imaging Spectrograph Observations. The Astrophysical Journal. 2013, 770 (2): 86. Bibcode:2013ApJ...770...86W. arXiv:1304.7273. doi:10.1088/0004-637X/770/2/86. ^ Macchetto, F.; Marconi, A.; Axon, D. J.; Capetti, A.; Sparks, W.; Crane, P. The Supermassive Black Hole of M87 and the Kinematics of Its Associated Gaseous Disk. Astrophysical Journal. 1997, 489 (2): 579–600. Bibcode:1997ApJ...489..579M. arXiv:astro-ph/9706252. doi:10.1086/304823. ^ Di Matteo, Tiziana; Allen, Steven W.; Fabian, Andrew C.; Wilson, Andrew S.; Young, Andrew J. Accretion onto the Supermassive Black Hole in M87. The Astrophysical Journal. 2003, 582 (1): 133–40. Bibcode:2003ApJ...582..133D. arXiv:astro-ph/0202238. doi:10.1086/344504. ^ Batcheldor, D.; Robinson, A.; Axon, D. J.; Perlman, E. S.; Merritt, D. A Displaced Supermassive Black Hole in M87. The Astrophysical Journal Letters. 2010, 717 (1): L6–L10. Bibcode:2010ApJ...717L...6B. arXiv:1005.2173. doi:10.1088/2041-8205/717/1/L6. ^ Cowen, Ron. Black hole shoved aside, along with 'central' dogma. ScienceNews. 9 June 2010, 177 (13): 9 [29 May 2010]. ^ Madrid, Juan P.; Harris, William E.; Blakeslee, John P.; Gómez, Matías. Structural Parameters of the Messier 87 Globular. The Astrophysical Journal. 2009, 705 (1): 237–44. Bibcode:2009ApJ...705..237M. arXiv:0909.0272. doi:10.1088/0004-637X/705/1/237. See Fig. 6. for a plot of the effective cluster radius versus galactocentric distance. ^ Dehnen, Walter. M 87 as a Galaxy. (编) Hermann-Josef Röser; Klaus Meisenheimer. The radio galaxy Messier 87: proceedings of a workshop. Ringberg Castle, Tegernsee, Germany: Springer: 31. 15–19 September 1997. Bibcode:1999LNP...530...31D. doi:10.1007/BFb0106415. ^ Steinicke, Wolfgang; Jakiel, Richard. Galaxies and how to observe them. Astronomers' observing guides. Springer. 2007: 32–33. ISBN 1-85233-752-4. 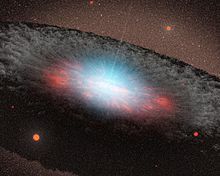 ^ Werner, N.; Böhringer, H.; Kaastra, J. S.; de Plaa, J.; Simionescu, A.; Vink, J. XMM-Newton high-resolution spectroscopy reveals the chemical evolution of M 87. Astronomy and Astrophysics. 2006, 459 (2): 353–60. Bibcode:2006A&A...459..353W. arXiv:astro-ph/0608177. doi:10.1051/0004-6361:20065678. 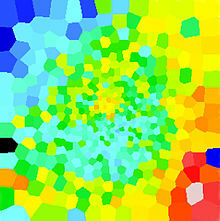 ^ Galactic Chromodynamics. ESO Picture of the Week. [14 October 2014]. ^ Baes, M.; 等. The Herschel Virgo Cluster Survey. VI. The far-infrared view of M 87. Astronomy and Astrophysics. 2010, 518: 1–4. Bibcode:2010A&A...518L..53B. arXiv:1005.3059. doi:10.1051/0004-6361/201014555. ^ Clemens, M. S.; 等. The Herschel Virgo Cluster Survey. III. A constraint on dust grain lifetime in early-type galaxies. Astronomy and Astrophysics. July 2010, 518: 1–4. Bibcode:2010A&A...518L..50C. arXiv:1005.3056. doi:10.1051/0004-6361/201014533. ^ Jones, Mark H.; Lambourne, Robert J.; Adams, David John. An introduction to galaxies and cosmology. Cambridge University Press. 2004: 13. ISBN 0-521-54623-0. ^ Tamura, Naoyuki; Sharples, Ray M.; Arimoto, Nobuo; Onodera, Masato; Ohta, Kouji; Yamada, Yoshihiko. A Subaru/Suprime-Cam wide-field survey of globular cluster populations around M87 - I. Observation, data analysis and luminosity function. Monthly Notices of the Royal Astronomical Society. 2006, 373 (2): 588–600. Bibcode:2006MNRAS.373..588T. arXiv:astro-ph/0609067. doi:10.1111/j.1365-2966.2006.11067.x. ^ Nelson Caldwell; Jay Strader; Aaron J. Romanowsky; Jean P. Brodie; Ben Moore; Jurg Diemand; Davide Martizzi. A Globular Cluster Toward M87 with a Radial Velocity < -1000 km/s: The First Hypervelocity Cluster. 25 February 2014. Bibcode:2014ApJ...787L..11C. arXiv:1402.6319. doi:10.1088/2041-8205/787/1/L11. ^ Aguilar.D.A; 等. Entire Star Cluster Thrown Out of its Galaxy. Harvard-Smithsonian Center for Astrophysics. ^ Zhang, Hong-Xin; Peng, Eric W.; Côté, Patrick; Liu, Chengze; Ferrarese, Laura; Cuillandre, Jean-Charles; Caldwell, Nelson; Gwyn, Stephen D. J.; Jordán, Andrés; Lançon, Ariane; Li, Biao; Muñoz, Roberto P.; Puzia, Thomas H.; Bekki, Kenji; Blakeslee, John P.; Boselli, Alessandro; Drinkwater, Michael J.; Duc, Pierre-Alain; Durrell, Patrick; Emsellem, Eric; Firth, Peter; Sánchez-Janssen, Rubén. The Next Generation Virgo Cluster Survey. VI. The Kinematics of Ultra-compact Dwarfs and Globular Clusters in M87. The Astrophysical Journal. 2015, 802 (1): 26. Bibcode:2015ApJ...802...30Z. arXiv:1501.03167. doi:10.1088/0004-637X/802/1/30. 30. ^ Tamura, Naoyuki; Sharples, Ray M.; Arimoto, Nobuo; Onodera, Masato; Ohta, Kouji; Yamada, Yoshihiko. A Subaru/Suprime-Cam wide-field survey of globular cluster populations around M87 - I. Observation, data analysis and luminosity function. Monthly Notices of the Royal Astronomical Society. 2006,. Online Early. ^ Wu, Xiaoan; Tremaine, Scott. Deriving the Mass Distribution of M87 from Globular Clusters. The Astrophysical Journal. 2006, 643 (1): 210–221. ^ Doeleman, S. S.; Fish, V. L.; Schenck, D. E.; Beaudoin, C.; Blundell, R.; Bower, G. C.; Broderick, A. E.; Chamberlin, R.; Freund, R.; Friberg, P.; Gurwell, M. A.; Ho, P. T. P.; Honma, M.; Inoue, M.; Krichbaum, T. P.; Lamb, J.; Loeb, A.; Lonsdale, C.; Marrone, D. P.; Moran, J. M.; Oyama, T.; Plambeck, R.; Primiani, R. A.; Rogers, A. E. E.; Smythe, D. L.; Soohoo, J.; Strittmatter, P.; Tilanus, R. P. J.; Titus, M.; Weintroub, J. Jet-Launching Structure Resolved Near the Supermassive Black Hole in M87. Science. 2012, 338 (6105): 355–358. Bibcode:2012Sci...338..355D. PMID 23019611. arXiv:1210.6132. doi:10.1126/science.1224768. ^ Kovalev, Y. Y.; Lister, M. L.; Homan, D. C.; Kellermann, K. I. The Inner Jet of the Radio Galaxy M87. The Astrophysical Journal. 2007, 668 (1): L27–L30. Bibcode:2007ApJ...668L..27K. arXiv:0708.2695. doi:10.1086/522603. ^ Sparks, William B.; Fraix-Burnet, D.; Macchetto, F.; Owen, F. N. A counterjet in the elliptical galaxy M87. Nature. 27 February 1992, 355 (6363): 804–06. Bibcode:1992Natur.355..804S. doi:10.1038/355804a0. ^ Klein, Uli. The Large-Scale Structure of Virgo A. (编) Hermann-Josef Röser; Klaus Meisenheimer. The radio galaxy Messier 87. Lecture notes in physics. Ringberg Castle, Tegernsee, Germany: Springer. 15–19 September 1997. Bibcode:1999LNP...530...56K. doi:10.1007/BFb0106418. ^ Baldwin, J. E.; Smith, F. G. Radio emission from the extragalactic nebula M87. The Observatory. 1956, 76: 141–44. Bibcode:1956Obs....76..141B. ^ Biretta, J. A.; Sparks, W. B.; Macchetto, F. Hubble Space Telescope Observations of Superluminal Motion in the M87 Jet. The Astrophysical Journal. August 1999, 520 (2): 621–26. Bibcode:1999ApJ...520..621B. doi:10.1086/307499. ^ Tsvetanov, Zlatan I.; Hartig, George F.; Ford, Holland C.; Dopita, Michael A.; Kriss, Gerard A.; Pei, Yichuan C.; Dressel, Linda L.; Harms, Richard J. M87: A Misaligned BL LAC?. Astrophysical Journal. 1998, 493: L83–L86. Bibcode:1998ApJ...493L..83T. arXiv:astro-ph/9711241. doi:10.1086/311139. ^ Reimer, A.; Protheroe, R. J.; Donea, A. .-C. M87 as a Misaligned Synchrotron-Proton Blazar. Proceedings of the 28th International Cosmic Ray Conference. July 2003: 2631. Bibcode:2003ICRC....5.2631R. ^ Roy, Steve; Watzke, Megan. Chandra Reviews Black Hole Musical: Epic But Off-Key. Chandra. Harvard-Smithsonian Center for Astrophysics. October 2006 [25 April 2010]. ^ Wirsing, Bernd. Discovery of Gamma Rays from the Edge of a Black Hole. Max Planck Society. 26 October 2006 [3 December 2010]. ^ Harris, D. E.; Cheung, C. C.; Biretta, J. A.; Sparks, W. B.; Junor, W.; Perlman, E. S.; Wilson, A. S. The Outburst of HST-1 in the M87 Jet. The Astrophysical Journal. 2006, 640 (1): 211–18. Bibcode:2006ApJ...640..211H. arXiv:astro-ph/0511755. doi:10.1086/500081. ^ Harris, D. E.; Cheung, C. C.; Stawarz, L. Variability Timescales in the M87 Jet: Signatures of E Squared Losses, Discovery of a Quasi-period in HST-1, and the Site of TeV Flaring. Bulletin of the American Astronomical Society. January 2009, 41: 393. Bibcode:2009AAS...21333207H. arXiv:0904.3925. ^ Karl Gebhardt et. al. THE BLACK HOLE MASS IN M87 FROM GEMINI/NIFS ADAPTIVE OPTICS OBSERVATIONS. The Astrophysical Journal. ^ Astronomers 'Weigh' Heaviest Known Black Hole in our Cosmic Neighborhood. Gemini Observatory/McDonald Observatory Press Release. January 14, 2011 [April 14, 2016]. ^ ASIAA, GLT Team. 格陵蘭望遠鏡*與次毫米波特長基線干涉儀計畫. Academia Sinica, Institute of Astronomy and Astrophysics. [April 14, 2016]. ^ 卜宏毅. 格陵蘭望遠鏡計畫 (PDF). 天文館期刊 (臺北市立天文科學教育館). August 2015, (69). ^ Ghosh, Pallab. First ever black hole image released. 2019-04-10 [2019-04-10] （英国英语）. ^ Côté, Patrick; 等. The ACS Virgo Cluster Survey. I. Introduction to the Survey. The Astrophysical Journal Supplement Series. July 2004, 153 (1): 223–42. Bibcode:2004ApJS..153..223C. arXiv:astro-ph/0404138. doi:10.1086/421490. ^ VIRGO CLUSTER. NASA-IPAC Extragalactic Database (NED). [2012-12-25]. ^ Binggeli, Bruno; Tammann, G. A.; Sandage, Allan. Studies of the Virgo cluster. VI - Morphological and kinematical structure of the Virgo cluster. Astronomical Journal. August 1987, 94: 251–77. Bibcode:1987AJ.....94..251B. doi:10.1086/114467. ^ 张梦然. 科学家确认人类观测史上最大最重黑洞. 科学日报. 2011-01-18 [2011-01-18].